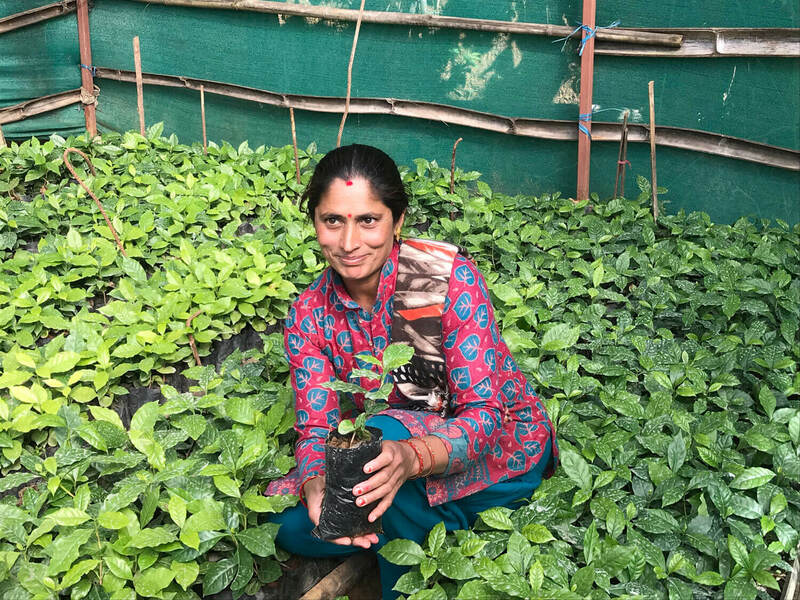 Lila Devi Funyal, President of Gyanjyoti Agriculture Multipurpose Cooperative at Fikure tends her coffee saplings for distribution. “I’m shaken and rattled to the bone,” exclaims Ambica as we lurch uphill, the vehicles skidding on exposed stones and sliding off the deeply gouged ruts. The driver wrestles with the wheel of the sturdy Indian SUV, zigzagging our way up the tortuous mountain road. I hold on to the back of Ambica’s seat as we pitch and roll like a boat in heavy seas. Climbing higher out of the murky air, the dusty roadside foliage, bamboo stands and delicate ferns give way to thinning conifers, blue skies and views of jagged soaring scenery. Between the trees, layers of hazy hilltops recede to rocky ridges newly dusted with snow, and the occasional glimpse of a distant white peak. Across the Trisuli Valley we can follow the scar of the Pasang Lhamu Highway snaking its way to the Kerung-Rasuwa border through a vast hillside dotted with habitation, a silver thread of river far below. 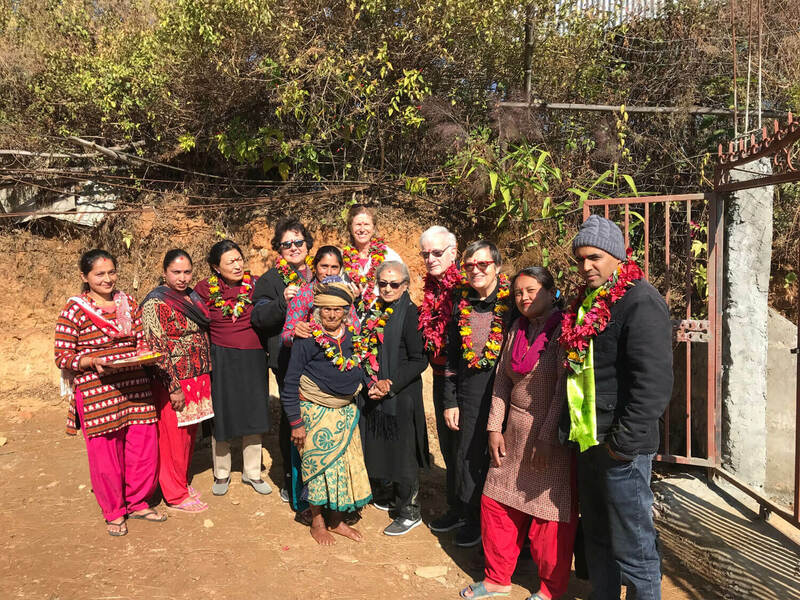 Our band of bouncing and bruised Rotarians is visiting three thriving women’s cooperatives in remote Nuwakot villages, way off the beaten track even though within sight of the Chinese border and Langtang tourist trails across the valley. Although we are in one of the worst earthquake affected areas, we see little sign of damage. The hillside villages are characterised by new one-story concrete houses pieced with metal rebar spikes waiting for the next floor. “Mexicans call them ‘fingers of hope’,” says Isabella, the minister’s wife. 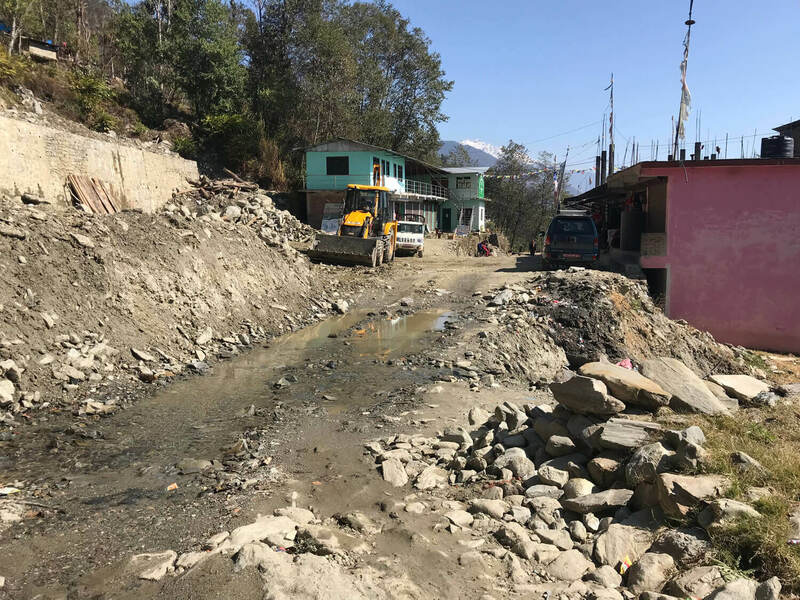 Rough road conditions but diligent rebuilding at the village of Kahule in Nuwakot district. 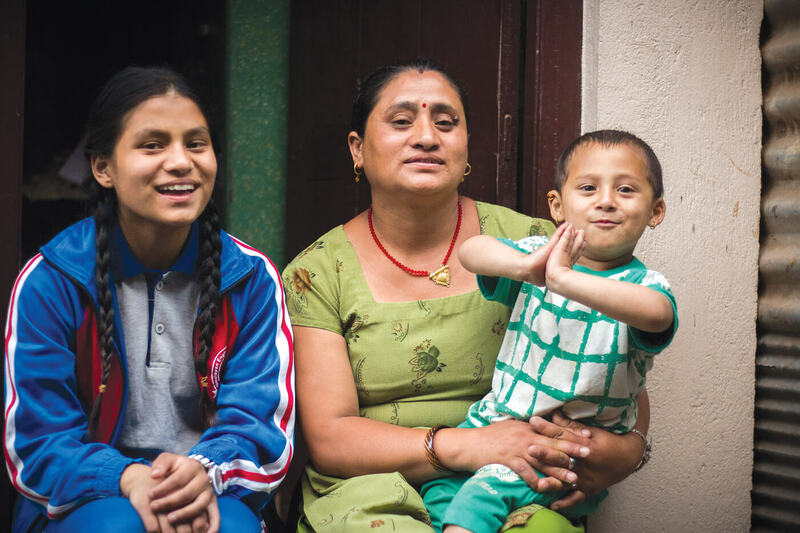 It is nearly four years since the earthquakes rocked our existence in Nepal, and we all have our own personal stories seared into our memories. Mine involve running barefoot onto my house lawn, hanging onto a garden chair for stability as terracotta tiles rain off the roof, my little red car buffeting back and forth in the driveway, and in the distance an unnatural pall of dust rising eerily to obscure the Valley floor. Most of us were lucky, but an unexpected rumble still startles, evoking the roar of that terrible great shake. The countryside narrative is different. 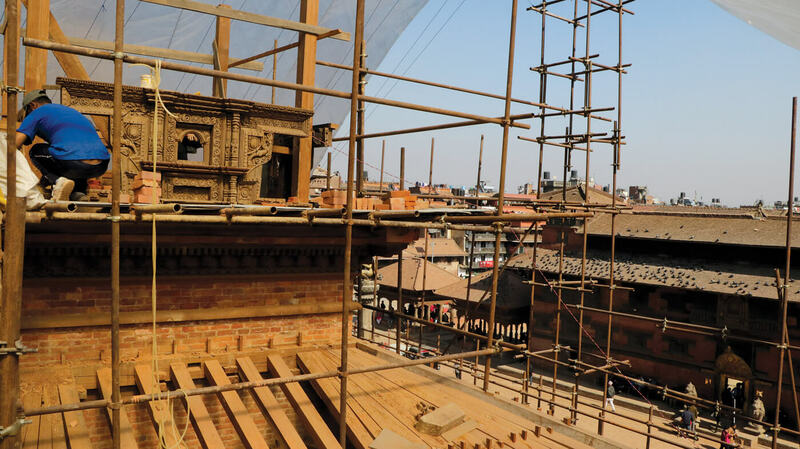 No amount of sterile statistics or dry data reporting the extent of devastation in Nepal’s central middle hills can prepare us for the reality of suffering on the ground. This is why we are here. 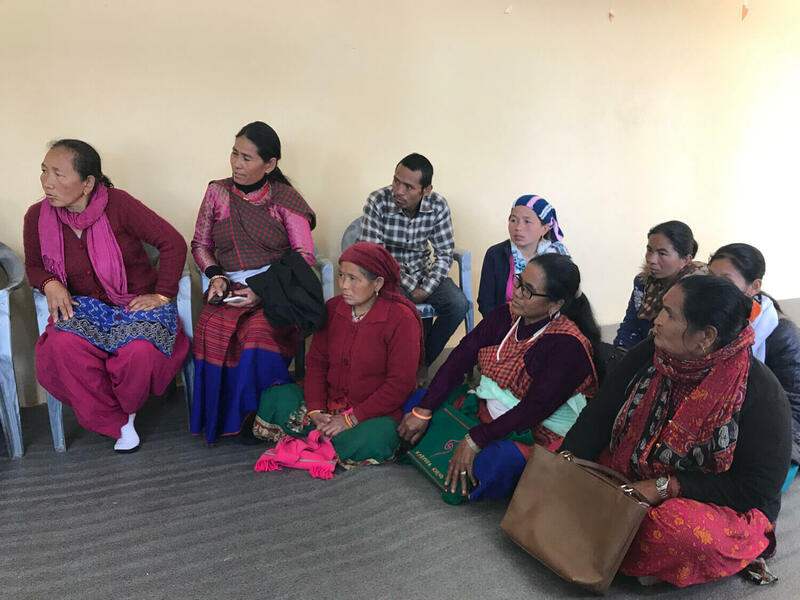 With most men gone to labour overseas, the Federation of Business and Professional Women of Nepal (BPWN) led by the indomitable Ambica Shrestha and her team, with donations from our Rotary Mid-Town, have been assisting these courageous lady farmers to diversify and rebuild their lives. Organic vegetables and the introduction of mountain coffee, a new commodity for Nepal’s hill regions, are supplementing the traditional crops of subsistence agriculture and helping recovery after the disaster. Coffee farmers of the Samyuktta Women Cooperative brief us about their activities at Kahule. The ‘parchment’ of unroasted coffee beans drying on a Kahule rooftop. 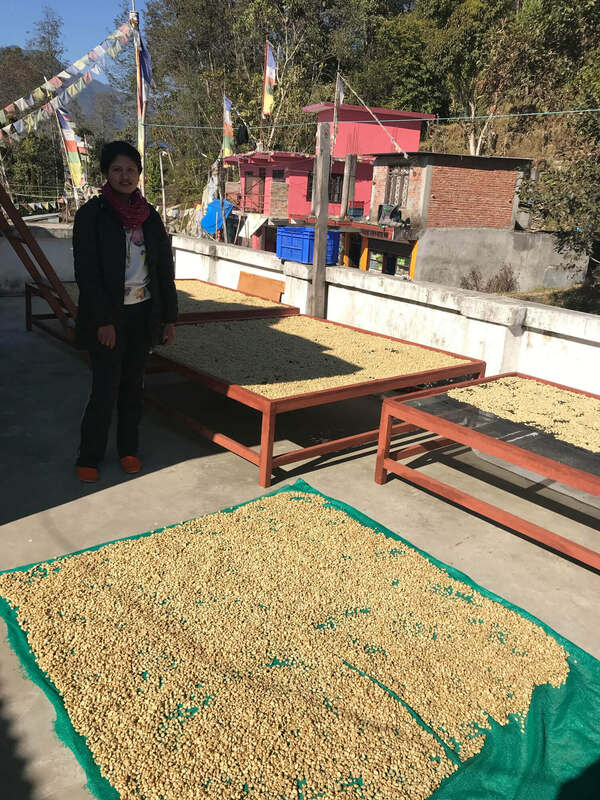 Putting their heads together as how best to help, Maya Devi came up with the concept of high value, organic, mountain Arabica coffee, just a few trees per family. She requested Ambica for training on how to cultivate and process the coffee fruit, a tree that requires little water, offers annual yields without replanting, and grows on unused edges of terraces and fields. Only by combined effort and some outside assistance would it make economic sense for these semi-literate ladies to take such a risky step towards a brighter future. 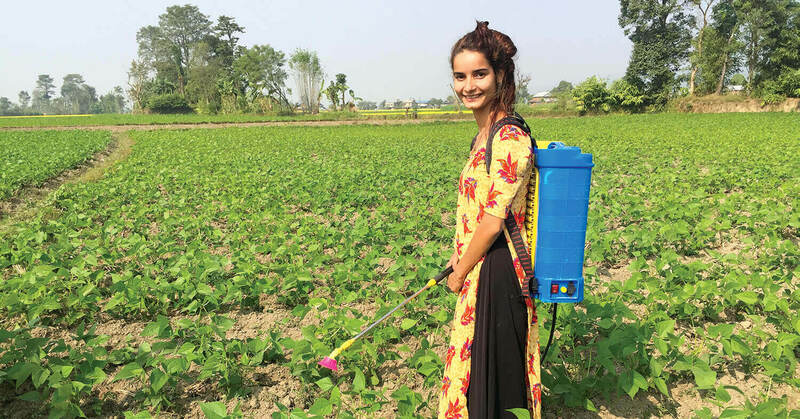 An enterprising neighbour had planted the idea years ago, a shy farmer Chetra Bahadur Tamang, who had never seen a coffee tree or tasted a fresh brewed cup but was convinced by an informative Radio Nepal broadcast that this was the cash crop for his community. He walked to Kathmandu to purchase a hundred seedlings, but was disappointed by the bitter, unpalatable concoction that the bushes eventually yielded. “Not understanding how to harvest or process, I was so disillusioned that I even chopped down some of the coffee trees,” he confesses, crossing his slender ankles. Rotary Mid Town delegation with BPWN team and women of the Gyanjyoti Agriculture Multipurpose Cooperative at Fikure. Swathed in thick jackets, sensible shoes,and welcome garlands our small delegation trudge through the enthusiastic coffee villages, observe the ‘cherry’ sorting, pulping and composting, inspect ‘parchment’ drying on rooftops, and admire nurseries of thriving saplings in homemade greenhouses. We are briefed on market linkages for the unroasted beans, and savour organic fruit and vegetable produce grown by the same innovative women’s groups. Driving home through Nuwakot’s capital, Bidur, last week at the end of a long day, diggers, trucks and bulldozers were plying the border highway, shaping culverts, gabion cages and road surfaces. The Trisuli riverbed is rapaciously mined for gravel and sand. Our vehicle is heavy with gifts in appreciation of Ambica’s work: fragrant cauliflowers, onions, yams and huge cabbages, the soil still clinging to their stalks. As we crest the Kathmandu Valley rim we are greeted with an ocean of glittering lights. The city roads are rough and pitted with no sign of that rural diligence, but perhaps one day our capital’s cappuccinos will be made with organic mountain coffee from Nuwakot.